Star Trek: Asterisk "The Offspring"
A lot of the times, new business pop up and their owners are so excited about this new venture that they think they need to see quick growth on social media. This mindset may lead them to make some rash decisions such as buying followers or spending too much on ads. And it may look impressive to investors to have gained over 1,000 followers in under a month, but savvy investors know there's more to it than that. And the day-to-day consumer probably won't even pay attention. 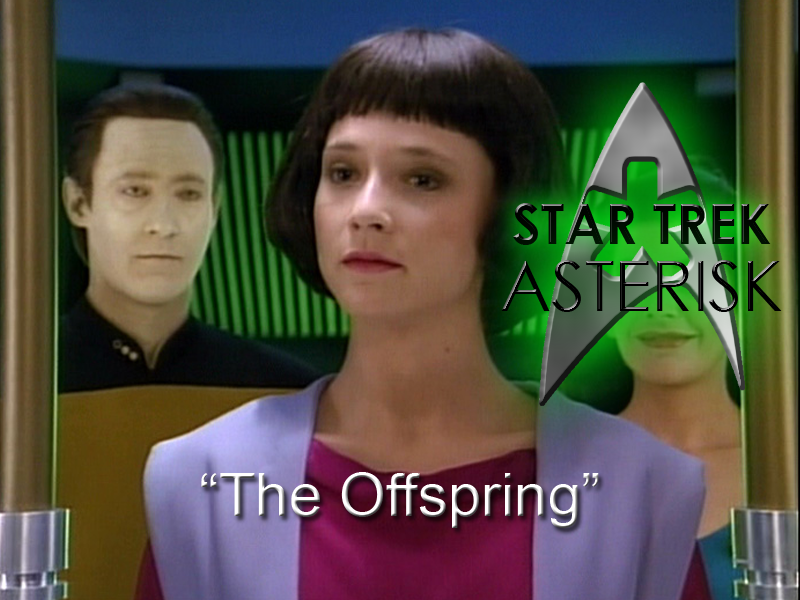 Data gets an idea of what it's like to be a dad and Starfleet stops that right in its tracks. The Captain's Logs are starting to get pretty funny. Or maybe that's just because I'm just now recognizing the fact that the first ones often have nothing to do with the story at all apart from ancillary exposition, for instance, in this case, that Riker is on personal leave. Meanwhile, without anyone else's knowledge, Data is creating another sentient being in his free time. He reveals to Troi, Wesley, and Geordi his creation and they are taken aback and when they bring Picard in on the existence of what Data calls "Lal," he's a little perturbed he wasn't made aware. Of course, now Picard's duty is to figure out what to do with Lal and what it really is. Data says "child," Picard says "machine." I say experiment. After a bit of a debate about the nature of Lal, Picard has a conversation with Data about the serious ramifications of creating another life form. Data's confused because usually other newborn children on board the Enterprise are met with celebration. Picard tries to convince him that Starfleet will see it as more than just a child, but Data tries to make him understand that he's the last of his species and every other species gets to procreate, so why not him? 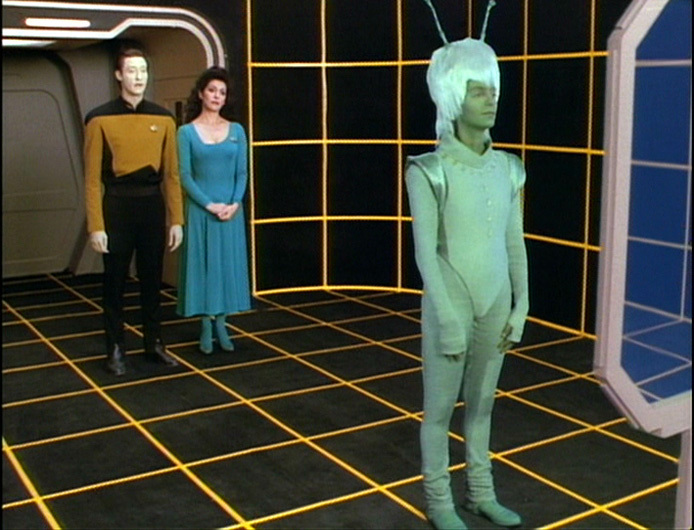 Well, then Data goes to help Lal find a suitable gender/species approximation. With Troi's help, Lal chooses to look like a Human female, though I think the Andorian female might have been more interesting. Imagine calling this your daughter. Data continues teaching Lal all about Life, the Universe and Everything. He teaches her how to sit, how to recognize art, how to catch a ball, etc. After a while, Wesley suggests that she should be hanging around with people to learn how to socialize. 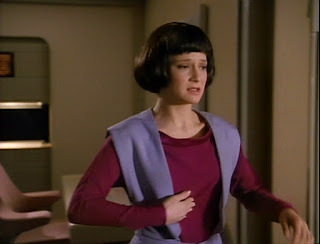 So, after he gives Lal the ability to learn about metaphysics and abstract ideologies, Data introduces her to 10-Forward and asks Guinan if Lal can have a job as a waitress. That's when they learn that Lal, unlike her father, has the ability to use contractions. She has exceeded Data's programming. He doesn't know why, but he's pleased. Meanwhile, Starfleet wants to take Lal, and only Lal, back to a Starfleet lab to make sure she has the "best" "teachers". Data thinks that's a bad idea, since she has plenty to learn on the Enterprise, but Picard is bound by orders from his admiral to at least consider it at this point. Picard is actually coming around to the idea that Lal is, in fact, Data's child, and is resistant to give that child over to Starfleet whether they have more experience or not, especially when Data wonders whether the admiral had a lot of experience with his first child. Sass award of the week goes to Data. On 10-Forward, Lal learns the ways of love by watching a couple making out in the corner. Guinan teaches her as much as she can, but leaves the rest to Data who, as we all know, is fully functional. That's when Riker comes back from personal leave and goes straight to 10-Forward where he is greeted with a make-out session from Lal, a young woman he has never seen before. Of course, Data walks in on this and asks what Riker's intentions are toward his daughter. A scared and confused Riker immediately ejects. And Lal accepts that she will never know love because she is but an android. Finally, Admiral Aftel arrives on board the Enterprise to observe what's been going on with Lal and he thinks it's crazy that a machine that can run 60 trillian calculations a second is working as a cocktail waitress. He's not very impressed with the conditions Lal is under (despite there being many other children on board who are doing just fine) and calls a meeting with Lal. He interviews her for a while to get an idea of what her life on the Enterprise is like, but when he tells her that she'll have to leave, she becomes visibly upset. But not until after she leaves the meeting. Think about that... this is an android... getting upset. This is what it FEEEEEEELS like to feel. She goes to Troi for help while Data sits in another interview with Admiral Haftel. 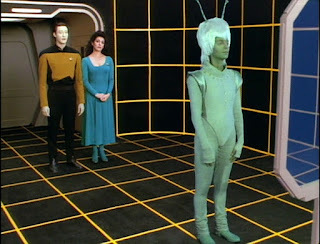 Data refuses to let him take Lal away, but then the admiral orders him to give up his daughter. That's when Picard steps in and tells Data to disregard that order. Picard can not in good conscience let Haftel have his way. Unfortunately, it's not going to matter soon. Troi calls in and tells Data to see Lal in the lab. She's experiencing cascade failure. Her emotions are killing her. Much like most of the users on Tumblr. The admiral tries to help Data save her, but she ultimately succumbs to her condition and dies. Not before telling Data that she loves him. Even though he can't love her back. 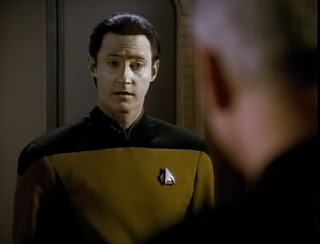 Everyone feels sorry for Data, but he says that he uploaded her memories to his positronic brain. So it's all good. This is a very heartwarming story about a father/daughter relationship that I really wish would have gone on beyond just one episode. It explores not only the nature of parenthood, but the nature of life itself and what role outside influences should or shouldn't have in parenting. Beyond that, we learn that it is possible for an android to learn emotion and not become evil like Lore, although it does cause her to go crazy and die. It's just a matter of development, I suppose. Thumbs up for this one. It's been a week since I posted about my intention to start a coworking space. In that time I've done a lot of thinking, a lot of lusting over empty lots, and a little bit of meeting with people who know things. Friday I took a meeting with Ken Evans and Christopher McElveen, two people who have been at the center of the entrepreneurial and coworking communities in Tampa for many years now. We went across the street from my apartment to Armature Works, I grabbed a coffee cola from Commune Coffee and we sat inside in plain view of the doorway to Bay 3, the newest coworking space to pop up in the area. I have officially surveyed what will be a perfect space for The Green Asterisk Coworking. I know it's a little early in the game to be thinking I've found the one, but, really... I think I've found the one. It's owned by a friend of a friend who used to use it as the home base for his manufacturing business. After expanding and moving out of it, he held onto it for a long time knowing he wanted to do something "cool" with it, but not sure what. When I came around with designs on a coworking and event space, our mutual friend knew that our visions would align perfectly. And they do! The space is roughly 3,000 sq feet and the owner is so excited to be a part of the space himself that he's willing to make deals that other landlords wouldn't so readily offer. So we've been emailing back and forth about how the offices should be built out and I think we're getting close to finalizing floorplans before construction can begin. There was an idea to bring together the greatest entrepreneurs Tampa had to offer and put them in the same building. Okay, so many other people have also had that idea. That's not the point. The point is I'm having this idea right now. And it's been swimming around in my head for a while. When I started working in Tampa, I worked at Tampa Bay Wave, a co-working space that, when I started, was housed in the Sykes building and contained and produced a number of successful startups. It now has locations on Kennedy and Channelside. I was only there for the Kennedy location before I moved on and started working from home.